Annual sales turnover more than RM75 million for the last three financial years. All corporates are entitled to participate, including listed companies. Maximum 20 winners, further selection of Top 3. Manufacturing: Annual or average sales turnover between RM5 million to RM75 million for the last three financial years. Services (fee-based): Annual or average sales turnover between RM5 million to RM10 million for the last three financial years. Must not be listed in any stock exchange. Maximum 100 winners, further selection of Top 10. Annual sales turnover below RM5 million or with a total sales turnover not exceeding RM15 million for the last three financial years. Open to foreign enterprise with annual sales turnover more than US$20 million for the lat three financial years. Open for nominations to all Malaysian corporates, including listed companies, so as to encourage more companies to move forward and expand into the global market. Annual sales turnover has to be US$20 million and above for the last three financial years, 50% of which are generated from international sales. Honored with the Golden Eagle Award trophy and a certificate. Enjoy advertising privileges from Nanyang Siang Pau for a period of one year. 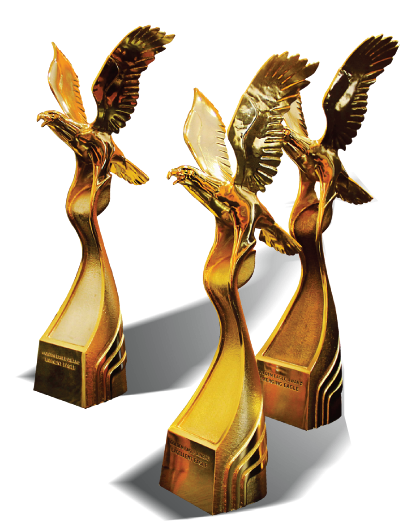 Authorized to use the Golden Eagle Award logo on their corporate collaterals. Exclusive participation activities for Golden Award winners.